Chris Bay is best known as the lead singer and guitarist for the band Freedom Call. 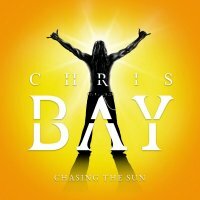 Those familiar with the German Power Metal group will instantly recognise the distinct vocals of Bay, albeit in a more refrained and refined style on his first solo album 'Chasing The Sun'. The eleven songs were created over a long period of time and finally put together by Bay in the spring of 2017; however, despite this time period, they gel very well as a collective body of work. In terms of sound, opening track 'Flying Hearts' epitomises the whole album with a style that can be best described as an oxymoron in that it is modern sounding with an eighties' vibe. Indeed, Bay manages to blend both seventies and eighties styles seamlessly with a modern twist throughout. Tracks like 'Silent Cry' and 'Misty Rain' bring to mind Scottish rockers Simple Minds, whilst 'Light My Fire' is more Pop Rock but with a Celtic vibe. The Eurovision style of 'Move On' reminds me of Rammstein at half speed and you could imagine this song being recorded by one of a myriad of today's Symphonic Metal bands. 'Move On' is one of the standout songs as is 'Radio Starlight', a natural choice as first single as it's the most commercial song on the release. My least favourite track is the poppy 'Hollywood Dancer' which features both piano and Wurlitzer, the latter giving it a definite seventies feel. Although not your archetypical ballad, 'Where Waters Flow In Heaven' is a slower, atmospheric song that possesses its own visible darkness. The stylish but sleazy 'Bad Boyz' precedes the final track, and this is yet another album that concludes with a ballad entitled 'Love Will Never Lie'; personally, I think it would have been better-suited positioned midway. This album further highlights the immense talents of Chris Bay – as both a singer and a song-writer – and is a cleverly written and produced slice of Modern Pop Rock which embraces the great sounds of decades before. Oxymoron's aside, it is my unbiased opinion that the Soft Rock of 'Chasing The Sun' is awfully good.